The natural beauty of Stevens County is a big reason people move, recreate or settle down in the Chewelah area. Along with living in a less urban environment, new challenges arise that many in the area feel Olympia lawmakers and agency officials are either unfamiliar with or uncaring to the relatively sparse population. One of those challenges are predators: cougars, wolves, bears and bobcats. Namely, people, organizations and the state are grappling with what to do when there are conflicts and just how things should be managed. Several issues have cropped up for residents, including attacks of livestock, what they feel is a slow or inadequate response from government agencies and a seemingly growing predator problem in the area. What is Stevens County currently experiencing? It’s not a simple matter. There are many viewpoints, conflicting information and even a conspiracy theory or two. In the 1990s, Washington voters passed an initiative banning hound hunting in the state. This is the point where some residents feel the cougar population started getting a free pass. Cougars certainly have a large habitat to choose from. They have one of the broadest ranges in the western hemisphere as they can be in the Canadian Yukon or all the way down on the tip of South America. WDFW estimates there are about 2,000 independent cougars in Washington State. Typically they’re larger than any other kind of felines you might run across in the world, except for lions, tigers and jaguars. Last year, a 200-pound cougar was discovered in Pend O’Reille County. As obligate carnivores, they must feed on meat to survive, and a survey taken in North America showed that 68 percent of cougars’ prey was ungulates, mostly deer. This doesn’t preclude farm animals, and this has become an issue locally as livestock owners struggle with these predators. While a cougar attack on pets and livestock has been a reality of just living out in the western U.S., people and local lawmakers feel the attacks are happening more often and closer to home. WDFW carnivore researcher Brian Kertson, however, contends that some of the apprehension has to do with population growth in the area. Since 1970, Stevens County has grown from 17,430 to 45,000. Combine that with the white tail population, and the pastures and valleys where they graze, and it can result in a lot of cougar movement. The modern age of technology also means more game cameras and security cameras to see the animals when they otherwise wouldn’t have seen the felines hunting at their normal hunting time at night. Facebook too, has been a big move forward in reporting predator sightings. Before you’d have to talk with your neighbor or friend before hearing about a predator, now it’s posted in many of the county’s several predator Facebook groups. Kertson contends that while people can see more movement of cougars, it doesn’t necessarily mean a larger population. Anyone with a housecat knows felines can be territorial. Cougars are no different, and biologists say that for the most part males self-regulate but carving out and patrolling their own territory. But with a younger population, meaning young male cats, these cougars can be more transient, get into trouble closer to humans and territories tend to be more erratic meaning you see more movement. In Stevens County, the fear from groups like the NE WA Wildlife Group is that the cougar population is negatively affecting the deer population in the area. This hunting group, which for years was a small collection of a few people, has since grown to meetings with 50 people or more at the Chewelah Casino every month. The group recently has been pushing for a four-point minimum on bucks as they feel this is one way they can help the deer population recover. Their feeling is that WDFW is mismanaging the wildife situation in the state, contending that deer population summer surveys have averaged 43 percent below their objectives for six of the last seven years. Former State Senator Bob Morton had worked on a pilot program for some hounding in the state, while current State Representative and rancher Joel Kretz has been a longtime critic of cougar management, proposing legislation to bring back hound hunting of cougars for the general public along with other measures. State Senator Shelly Short recently had her sponsored Senate Bill 5525 which would direct the Department of Fish and Wildlife (DFW) to conduct specific whitetail deer population assessments in northeast Washington, while also requiring WDFW to make hunter harvest data available prior to establishing hunting seasons. Stevens County prosecutor Tim Rassmussen and members in his office have suggested a Livestock Protection Program where perhaps county officials could manage cougar populations while also using hounds. The sheriff and commissioners have stated that the sheriff already has jurisdiction if humans or property are at risk. County wildlife specialist Jeff Flood is also on-call 24/7 to respond to conflicts along with WDFW officers. 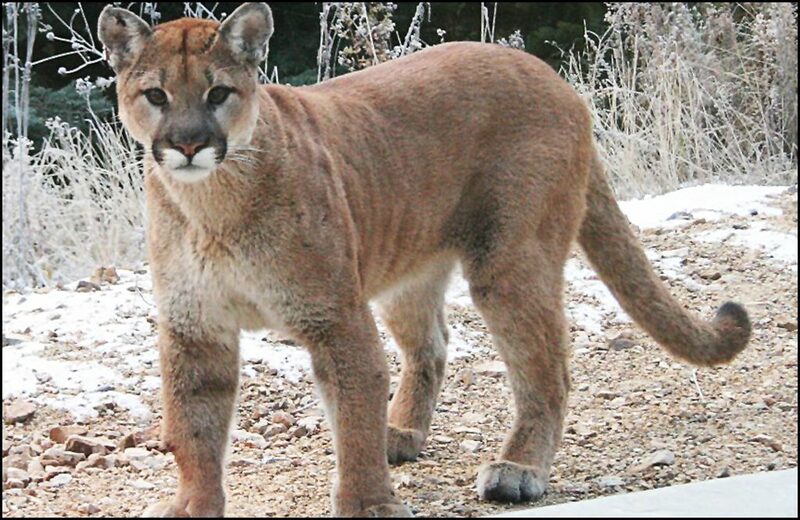 The ultimate fear by people is the possibility somebody locally could be killed from a cougar attack. Chewelah resident Dee Dee Isaacs who recently lost one of her miniature donkeys to a cougar, said that the attack left her own son terrified to go outside. Pouring herself into research on the topic, she’s found lists of cougar attacks and conflicts that make her feel it is a serious public safety issue. In May of 2018 in Washington, two cyclists were attacked by a cougar with one being killed. It was the second recorded fatal cougar attack in 100 years. In comparison, there are 20 to 30 fatal dog attacks a year nationally, while there have been just 27 recorded fatal cougar attacks in North America in the last 100 years. According to Kertson, cougar attacks can be quite random and rare. “You have cougar attacks on Vancouver Island where they hunt cougars quite intensely, and then you have cougar attacks in California where they allow no cougar hunts,” Kertson said. Kertson said WDFW receives an average of roughly 200 confirmed cougar reports throughout the state each year – depredations of domestic animals and encounters with people. He understands, however, that when its a large animal with sharp claws and teeth it’s an innate reaction to be fearful. Kertson said that humans aren’t on the menu for cougars, as their evolutionary prey are four legged ungulates. That doesn’t mean a person shouldn’t treat a cougar as a wild animal, as it can be hungry, diseased or a variety of other issues that may cause it to attack. Despite it being something of a statistical anomaly, Isaacs and many other livestock owners in the area are fearful. She contends the number of cougar attacks in places like California and bemoans the fact that people are afraid to go outside. “My cousin was stalked last year by a cougar…in woods we roamed…as kids. She didn’t have a gun only a cell phone which didn’t have a signal,” Isaacs said. What is usually lost in articles about wildlife attacks, is the emotional toll is takes on livestock owners. When talking with The Independent, WDFW officials pointed out that these attacks can be very emotional and that their responses can sometimes not seem like a solution to an issue. In many cases, there’s no real solution to the loss. Karla Peters lost five sheep to a cougar attack in the Chewelah area recently. WDFW could not follow the trail with dogs and while one dead sheep was placed with game cameras watching to see if they couldn’t fine the culpruit, nothing came back. Peters suffered a second attack on animals but WDFW could not follow with tracking dogs for the offending cougar because it crossed onto land they didn’t have permission for. “We were advised to lock up our live stock at night and let them out every morning which has become a burden on me as you have to be here every evening before dark and every morning at daylight to let them out,” Peters said. Kertson said that the best option for livestock owners would be to board them at night in an enclosed structure, in fenced pasture free of vegetative cover as far as possible from the forest edge or attended by a livestock dog. But he also pointed out that not everyone can do this, and sometimes its not financially feasible for owners. He added though that these methods usually have the best results for people wanting to avoid conflicts with cougars. But for Peters, who had a small farm, she and her son decided it wasn’t worth the time or cost of losing animals to predators and said they are in the process of selling their livestock. “It’s because it’s so heartbreaking to see all your effort to be lost for nothing,” Peters said. Isaacs too pointed out her lost donkey was her sons best friend, and that the reason she’s been so vocal about the cougar issue is the effect it has had on her son. South of Chewelah, Jennifer Swiger is raising goats. She said she had a cougar stalking her goats when someone hit the predator with their car. The injured cougar was never tracked down, but it did not reduce the fear that Swiger had with this animal roaming around their small farm. Manke said the Sheriff’s Office has been been sending our specialist and often a deputy to depredations that are called in to them and they notify WDFW as well. If the call comes directly to WDFW, then the state agency usually responds by themselves. He added that he would prefer the lead agency on wildlife matters be WDFW, but that the sheriff’s office can respond to eminent threats from wildlife. “There has not been any particular catalyst for our news release, we are just trying to educate the public on reporting procedures,” Manke said. Wildlife officials have many suggestions that, while they say are effective, understand that people living a rural lifestyle in Stevens County may not be able to completely carry out. This would include feeding your outdoor cats inside, bringing livestock indoors at night, keeping an eye or monitoring livestock and making sure your pasture doesn’t include wooded areas that cougars like to hunt in. Stevens County Commissioner Don Dashiell said he would like to see the quota numbers for hunting cougars be raised in local game units, and for problem cougars taken down by wildlife officials not to be added to that number. He added that the commissioners would like to see more hounds be used in some sort of manner, something akin to a pursuit season where hounds could tree cougars to keep them more weary of humans. Dashiell, along with residents said they’d like to see problem cougars immediately taken care of. WDFW officials contend there would be no direct correlation between animal attacks and human attacks and add that sometimes lethally removing a nearby cougar from an attack does no good because you can’t tell if it’s the same cougar. Cougars can range many miles in just one day. Isaacs disagrees with this sentiment, saying she knows of one incident of a problem collared cougar that was not tracked down. A big thing echoed by many local people, Dashiell and the recent NE WA Wildlife Group, was a local response along with WDFW. While Flood and the deputies don’t go after the cougars unless a direct threat is happening, the thought is the local response can be helpful serving as a liaison between residents and the state agency because of considerable tension between the two. Living with cougars won’t suddenly stop being an issue in Stevens County, but it does appear there are many voices, many ideas and an emotional toll where nature and man meet.